Every kid loves to play outside and most of us try hard to make their own backyard an exciting and fun place to be, whilst at the same time doing our very best to make sure that they are able to play safely. One of the best materials you can use for creating a safe play area for your kids is play sand, and we all know what it is and where to buy it from, but to reassure you about its suitability, it is worth telling you where is actually comes from. Play sand is specially formulated for children’s play areas and the grains that you lay down are different from the sand that you get on the beach. The first type of Play sand is an artificial sand creating by crushing rocks to a very fine consistency in order to get a fine grit finish that is considered acceptable for children to play with. This also contains silica which is taken from ground quartz and is very popular as it most resembles beach sand meaning that the kids can have a lot of fun building sand castles just like they would at the coast. The other type of sand available is known as construction sand and it has larger particles which some people prefer as it does not blow around as much because it is slightly heavier. All play sand available has to meet stringent quality standards and address any safety concerns, so you can choose to create a play area in your backyard using play sand that the kids will love and should be able to play safely with as well. 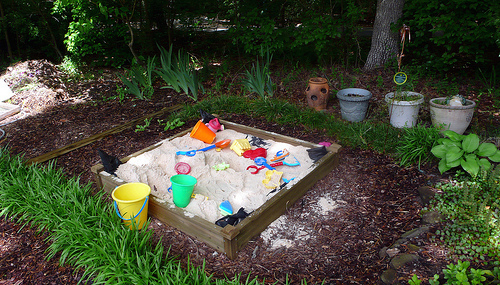 Children love to play with sand and water and provided you are in the garden to supervise their activities, it is also a safe way for them to play and have some fun. Not only will your kids be having a good time but as play is an integral part of their growth development they will be doing something that is actually helping their overall development and teaching them new social and play skills without them even thinking anything other than how cool their play area is and how they are enjoying themselves. Another really popular material for creating an excellent play environment in your backyard is play bark. Play bark is considered to be one of the safest and most natural ground cover that you can lay down when you are creating a kids play area in your backyard. Play bark is made from stripping the bark from any trees that are intended for commercial use and are collected from sawmills who strip the bark before the rest of the tree is sent to be made into posts or railway sleepers for example. The rough bark is graded using a special sizing machine that removes any sticks or larger pieces that would not be suitable for use and it also rather cleverly removes the smallest pieces of bark as well, so that you are left with just the chunky bark which is the best for making the springy surface that protects your children so well when playing. The play bark is an environmentally friendly product and can also be recycled when no longer required as a play surface and used as a compost around other parts of the garden. Play bark chippings have a loose feel to them and this actually helps to deter animals from fouling in the area, although ideally the play area should be fenced off anyway. 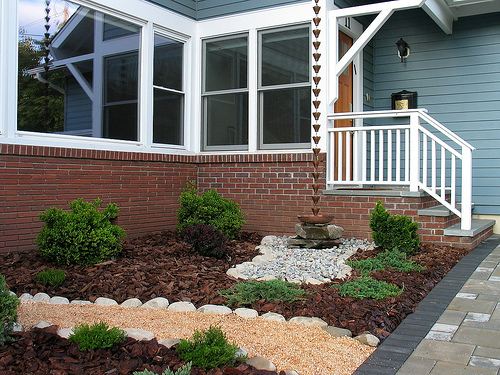 It looks a natural and attractive product which means that your backyard doesn’t just have to look like a playground as it is an attractive surface anyway. Take a look at the space that you have available and what it is you would like to put into the garden for the kids to play with. There are a few design aspects to consider before you set to work so that the play area you end up with works best for you, and is as safe as possible. 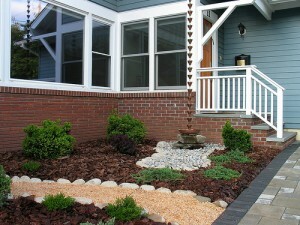 You should decide if you want to create a play area above or below the surface of the ground. It often looks a lot neater to take the top surface of turf and soil away and build up a layer of bark or play sound having firstly laid down a groundsheet to protect from weeds coming through and keep it in place more easily. Work out where the best place in the garden should be for creating the perfect play area, remembering that you want to be able to see them easily and supervise their activities, so building it at the end of the garden while you want to sit on the patio, may not be the best solution. If you choose your surface wisely and think about the landscaping you should end up with a play area that will give your kids many hours of fun and safe play time. Tom Grant is a passionate gardener and family man. He enjoys sharing his insights on various home and parenting blogs. Visit www.turfandstuff.com to get more ideas.